“The horses are not pets. They are workers. Do not let the horses eat; they have all day to eat. Now they are supposed to be working, they are on my time now.” This is the first thing I hear from the good looking young man dressed in levis, leather chaps with fringe, cowboy boots (with spurs), and a big rain slicker. The only thing missing is a cowboy hat, but this young paniolo opts for a baseball hat; giving this Hawaiian cowboy a modern twist. I hear this speech from Pa’akaula while I’m perched on top of one of those referred to ‘work horses’. A wave of seriousness comes over me, as my mind switches from ‘I’m a tourist’ mode to ‘I have a job to do’ mode. I’m about to participate in my first cattle herding experience…err…job. Strangely I’m not in Texas, Wyoming, or Colorado; I’m in Hawaii. The rain is pouring down, and the wind is whipping around me. 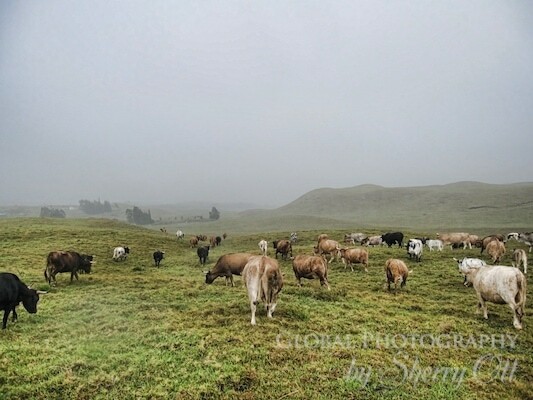 The skies are filled with gray low hanging clouds hiding the beautiful pasture views from me. I think about other tourists out on the beach on the sunny side of the Big Island, but I just had to be different. Now I’m on top of a horse named Red, slightly exhilarated and slightly nervous. I can hardly believe that a beginner rider like myself is about to embark on a cattle drive with absolutely no tourist fluff to it. But this is where I like to be, on the edge; the edge of excitement, nervousness, and newness. “The horse’s job is to do nothing. Your job is to make it do something. These horses are not trail horses; they will not follow each other. In fact, I don’t want you to follow each other, you need to be comfortable splitting up, “ says Pa’akaula. I continue to listen to the lecture and I can feel my adrenaline rise. 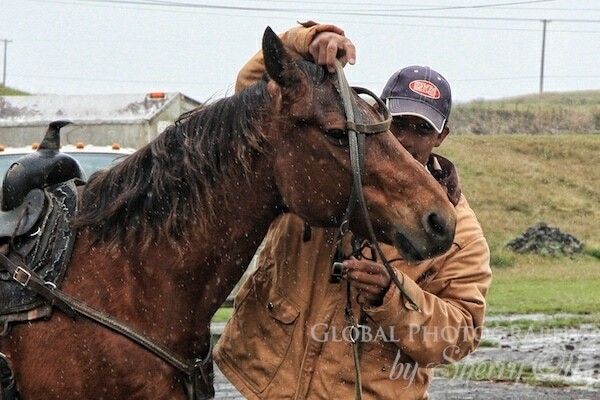 Pa’akaula comes over to my horse to tighten some parts of the saddle and he begins to give me my ‘driving’ instructions. He tells me how to get the horse to move forward, backward, turn left and turn right. He tells me how to stop the horse and make it stand still or stop the horse and make it back up. He instructs me to keep my heels down but keep pressure on my toes and to hold the reins as if I’m holding a bottle. I feel like I’m 16 again learning how to drive a car for the first time; it all sort of makes sense, but it’s nerve-wracking. To top it off, the rain is blowing sideways now. This isn’t the beautiful day I was hoping for when I signed up for this cattle drive. Instead I am cold and getting more and more soaked by the second. However, somehow the horrible weather makes the whole experience seem even that much more authentic. We aren’t out here for fun; we are out here to get a job done. 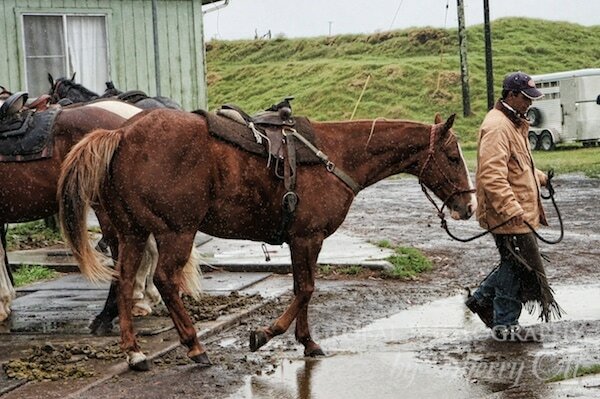 Pa’akaula tells us to walk our horses down the muddy drive until we get to the fence line, then stop and wait. He wants to see if we can successfully instruct our horses to do this simple task. I give Red two quick hard kicks with my heels and he slowly takes a few steps forward. Soon he is walking and as I continue to tap him with my heals occasionally. At the fence line we all stop successfully. Mission accomplished! We are now given our next set of instructions. Lead our horse to the patch of trees over the hill in the distance. There is a slight pause and then Pa’akaula firmly instructs us to not follow each other. “You all have to take a different route to get to the patch of trees,” he says. Now this is a bit more challenging, but my mind races with excitement. I pull the reins to the left and kick Red with my right heel in the hope that this will make him turn left. He stands there and doesn’t move. I think to myself, wait a minute, am I supposed to kick with my left or my right foot? My mind is second-guessing myself. Out of futility I decide to try again, this time Red turns and starts walking to the left. Success! I walk Red towards the patch of trees and watch my cowboy peers do the same, the three of us are all spread out as instructed. I feel free, I feel in control. I never in my life have had real control of a horse; directing it solely by my desire. I’ve done trail rides before, but there was little decision really left to the rider, the horse was in control. However now it is I who is in control. I decide to turn, I don’t take the most efficient route, and I choose to stop – just because I want to. It feels amazing. We continue to practice this horse control for the next 40 minutes; trying to teach the horse that we are the boss. The rain also continues, harder and harder. I can feel my jeans are already soaked underneath my rain slicker. The rain is dripping off the brim of my hat as well as my nose. I feel real. I feel like a paniolo; a Hawaiian cowboy. Pa’akaula tells us to scan for cattle, we now need to get an idea of where the cattle are so we can round them up. We walk the horses around the vast fence line scanning for cattle. However, truth be told, I don’t think I am looking for cattle as I am still struggling with becoming the master of Red. Red does the turns I instruct him to, but not quite with the precision I would like and the perfectionist in me wants to get it right. We spot the cattle all grazing in the same general area; there are about 35 of them. However off to the left I see black animals running the opposite direction of the herd and wonder if I should be pointing these ‘runaways’ out. However Pa’akaula reads my mind and quickly points out that those aren’t cattle, they are wild bore. Pa’akaula motions for us to gather up near the rest of the cattle; it is time to get down to work. The wind is whistling, the sky is dark and the cows look as if they really don’t want to move. 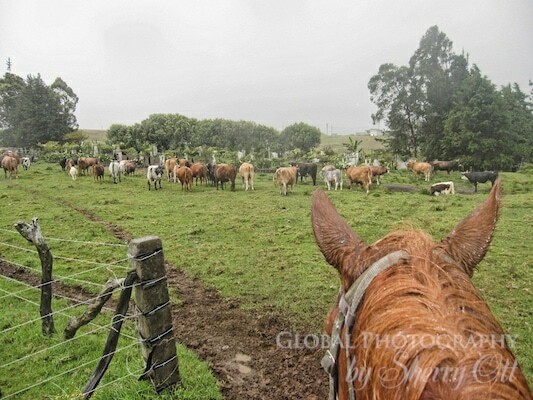 He gives us a little advice about how to use the fence line to keep the cattle ‘pinned’ in. He also suggests to be vocal in order to get the cattle to move. Pa’akaula looks at us each slowly and says, “Ok – this is your adventure, good luck!” and walks away on his horse. The perfectionist in me panics and wonders if he is leaving us! The three of us look at each other and swiftly make a game plan as there’s no time to waste in this uncomfortable weather. My fellow tourist herders bolster my confidence. We spread out as we have been doing all morning and go along the perimeter of the herd of cattle. Pa’akaula is watching from a perimeter spot ready to step in and chase any ‘runaways’. “Ya” I meagerly say, and walk towards the cattle in my area. Meager isn’t going to cut it. “Ya! Ya!” I yell. The cattle take notice and begin to walk in front of me. I smile to myself and think, “I just made cows move. “ I’m amused by the thought and strangely proud. The rain continues to pour down on us, but we are moving the cattle, slowly to the pen. I belt out more “Ya! Ya!” vigorously as I go up and down steep, narrow, muddy sections of the pasture. I am amazed that a beginner like myself it tackling this terrain, but there’s no time to dwell on it; I have confidence now in the ability of my sure-footed horse. I hold on as if I’m riding a mountain bike leaning into the hills and back on the downhill. All the while my eyes are on the cattle. I can see us all converging on our end destination. Pa’akaula opens the gate and the cattle instinctively enter. He closes the gate to the muddy pen signaling that our work is done. The three of us let out a sigh of relief and nod to each other in the rain; signaling a job well done. Today none us of feel like tourists, we feel like paniolos. The cattle are in the pen! Our work is done! • The website description was accurate – there was no fluff! • The instruction by the Ranch was good and even though we were separated in distance, they kept an eye on you. • The weather could have been better! That’s honestly all I could come up with! • They don’t always run the tour as they need enough people to do it. Check with them to see if they have a cattle herding experience available when you are there. Absolutely! This was one of my favorite things I did on the Big Island. I had always had a dream to herd cattle for some reason, and this was a great way to get a taste of it in a very unexpected place. 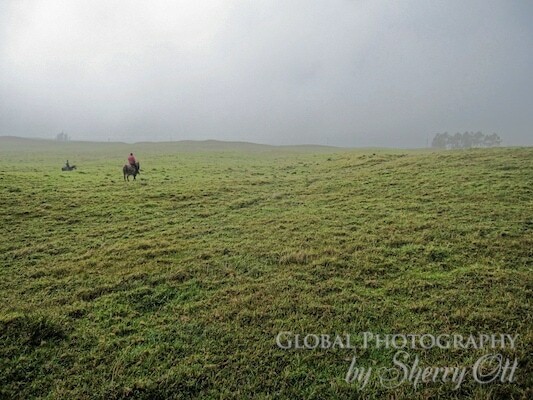 There are many places that offer trail rides on the Big Island, but Dahana is the only one who offers the cattle herding experience. I was skeptical at first thinking it might be watered down for tourists – but I honestly felt like I was a part of the real thing. 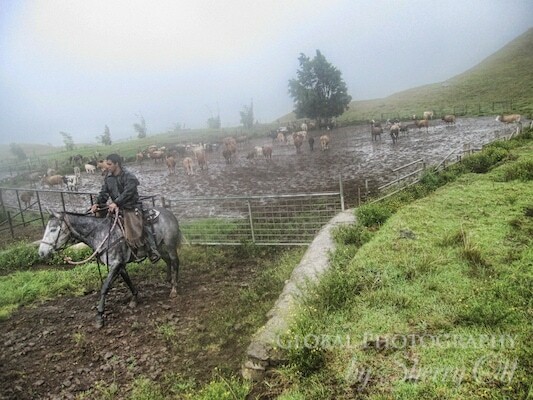 It was a lot of time on the horses, but the time went fast – even in the rain! 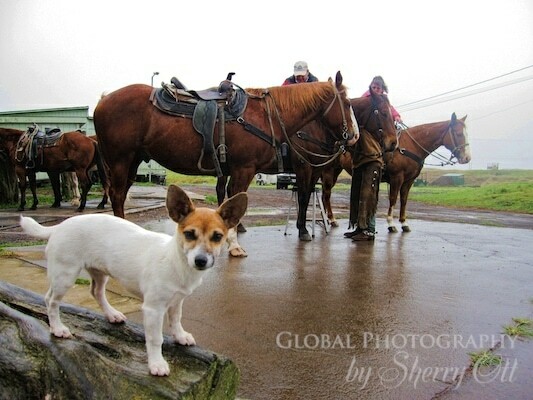 Disclosure: Dahana Ranch hosted my Cattle Drive experience. However, all of the opinions expressed here are my own – as you know how I love to speak my mind! Whether you’re looking for camping supplies, motor homes or pop up trailers, or mechanical accessories to travel trailers, such as rv awning light sets, there are plenty of resources that can offer you accessories for a price – a high price or possibly a low price. If you are shopping at retail stores like Target or Sears, then expect to pay top dollar. Have you ever thought about shopping at an RV store or RV dealership? While camping supplies might be priced intermediately, unless you meet a very friendly dealer (or know somebody) the RV store will probably charge you the full price for any RV part you need. It’s convenient to buy merchandise with an RV vendor, so of course you will be paying extra for that convenience. Used and new RV parts and other camper accessories can be found on the Internet, from online vendors who discount prices from the RV stores (since they do not worry about overhead costs for a rented or leased location) as well as wholesalers who offer prices just slightly above manufacturing costs. Some popular wholesalers online include RV Wholesalers, DTI Parts, and BR Wholesale RV and Marine. These vendors are ideal for ordering parts, whereas camping supplies from The Sportsman’s Guide. RV Toy Outlet is a good site for recreational gadgets to accompany your travel, like GPS units, lights and cameras. If you have a dealer’s license then you can check out www.WholesaleCentral.com for the best prices dealer to dealer. Used parts and supplies are another option that’s not as shaky as it sounds, provided you thoroughly inspect the used part and make sure it is in good working condition. Trailer parts and camper parts are available from auction sites like Ebay Motors, as well as classified ads in your newspaper and from RV Trader on line. On Ebay, you can find parts, patch kits, replacement fabric, hangers and clamps for travel trailer awnings. While there are plenty of sources for camping supplies, only a careful search and comparison between many vendors will give you the best bargain on Coleman camper accessories.